Sumptuous, stylish and sophisticated, Dana Beach Resort is everything and more when it comes to imagining your dream beach vacation, resplendent with gorgeous accommodation set in the most exquisite surroundings. Idyllically located in breathtaking Half Moon Bay, we serve up a slice of serenity – soothing the soul, freeing up the mind and replenishing your core well being. 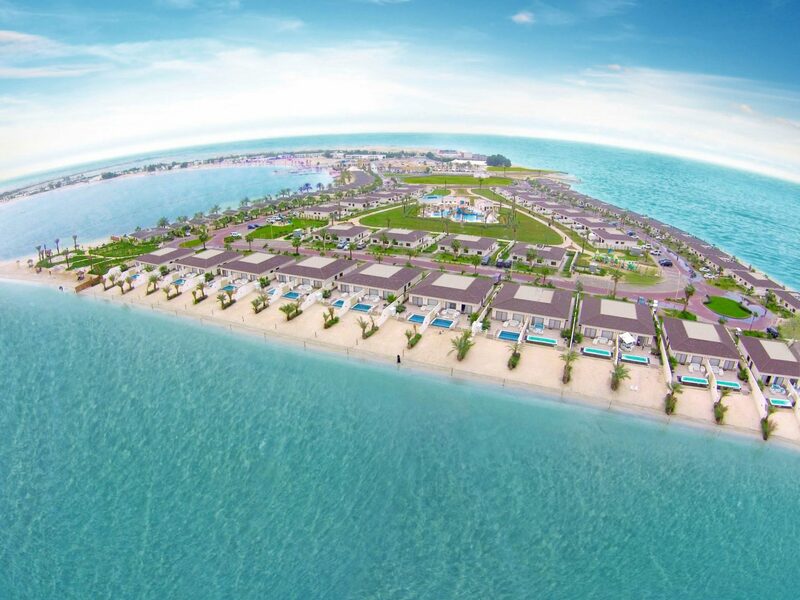 Spectacular and extraordinarily spacious, the stunning resort comprises 111 contemporary and elegantly appointed family villas, hosted in an environment bountiful in beautiful beaches, lush landscaped gardens and the warm glistening waters of the Arabian Gulf. Dana Beach Resort is a perfect getaway for a villa vacation, a long weekend, a romantic retreat or a honeymoon, in all seasons. We invite you to join us and experience the finest in resort-style living – the Dana Beach Resort way. Find yourself steps away from the sandy beaches of Half Moon Bay when waking up to the sounds of the sea washing ashore as a guest in a Royal Villa with pool. Enjoy the scenic views and cool breezes from your private beach or soak in the sun at the pool. The 3-bedroom villa, which includes a maid’s room, is ideal as a home away from home. Located on the beach, the Royal Villas with Jacuzzi offer exceptional beachfront views with immediate access to the beach. The villas offer relaxing space and a patio that open onto an access to your private beach, and includes a separate maid’s room. Stay amidst a perfect blend of awe-inspiring natural views and elegant luxury. Treat your senses to the welcoming breeze and a warm sunrise from the comfort of your patio. Our well-appointed villas include 3 spacious bedrooms and a separate maid’s room. Relax in our cozy sunset villas overlooking the beach with spectacular views over the sunset. Enjoy your patio, steps away from the sands and your private beach access. Families and couples find their enjoyment alike alongside the sparkling waters. A stay at Dana Beach Resort comes loaded with more water sports at the beach than any other Resort in Half Moon Bay. The stunning waters of Half Moon Bay allows for all kinds of water activities. A variety of exciting water sports is available from Jet skiing, boat rides, to deep sea diving. We invite you to explore the waters. Your kids will never want to leave the Kids Aqua Play area. They are assured of a great time as they plunge down one of the three water slides at our kid-friendly pools and water play area, located by the interior gardens of the resort. Dana Beach Resort provides guests with a large variety of recreational activities for all ages. We have dedicated children’s play areas designed to keep our little guests happy and entertained. From pools to kids aqua play and Indoor games, your children are sure to have the time of their lives! Go ahead and make a splash. Offering something for everyone, the pool area features adults pool, children pool and jacuzzi for toddlers. The pools are perfectly sized for swimming laps or relaxing in a float. Surrounded by a large terrace which features chaise lounge chairs, shading umbrellas, cabanas and palm trees in the midst, the pools overlook the waters of the Half Moon Bay. Al Sayyad offers exquisite Lebanese cuisine in an expansive outdoor terrace with views of the Arabian Gulf, which add a special charm to your dining experience. Fast good meets fine setting at Bay Diner. It’s where you can grab a delicious snack or pizza for your family anytime of the day. The golden rosy glow of the sunset is a perfect accompaniment to the tempting selection of fresh and local delicacies at the Samari Café. The Dolphin Restaurant, in a sublime setting overlooking the swimming pool offers a diverse menu that includes delicious traditional Arabic, Asian, and international cuisines. The Beach Club Café is all about a chilled atmosphere and attention to detail, serving enjoyable baked fare, sandwiches, desserts, and beverages. Visit Scoops, our in-house parlor for ice creams, frozen yoghurts, fresh juices and milk shakes. It’s got something to delight the young ones as well as the old. Hop in to our Coffee Shop for a selection of handcrafted coffees prepared by expert baristas. Sip in at leisure as you enjoy a relaxing conversation with family and friends. Our outdoor space is large enough to make a big impression. Whether for a reception, dinner or social venue, the Marina Plaza features spectacular seascapes and an impressive beachfront view. This Banquet Hall is perfect for a big wedding or a private event with a large number of guests. Designed to comfortably host up to 1200 guests, the hall offers stylish interior design, a private theater, spectacular lighting and is fitted with the latest in sound and visual equipment. This expansive Banquet Room is elegantly furnished to create the perfect ambiance for corporate gatherings or private parties. It is fully equipped with state-of-the-art sound and visual equipment and features its very own private theater. Catering can be tailored to suit your exact needs. Dana Beach Resort provides students a fun day outside of school full of activities for every child. Whether it’s plunging into temperature-controlled outdoor swimming pools after a ride down the slippery water slides, riding around the resort on a bike or club car, or simply challenging classmates to an entertaining game in the Kids Games Room, each child will be assured to have a blast. The most successful events always include spectacular catering. Allow of our talented catering team to create a menu developed specially for your event. From the simplest coffee break to the most elaborate themed banquet, indoor or outside, our experienced chefs and culinary team will dazzle your guests with their creative and sumptuous dishes. 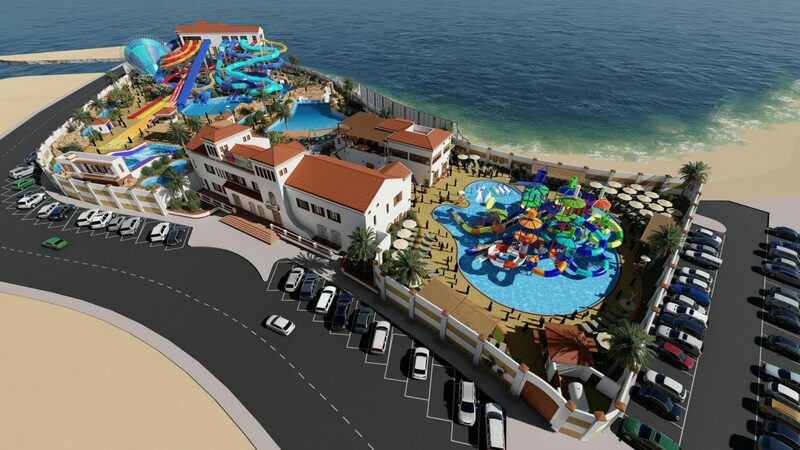 Loopagoon will be the first major water park of its kind in the Eastern Province of Saudi Arabia featuring an exciting mix of rides, slides, and attractions targeted for the entire family. Nestled on the shores of Dana Bay’s beautiful lagoon waters; Loopagoon will bring the water to life for everyone. Whether guests want to float and relax, get their adrenaline pumping, or simply watch their children splash around; Loopagoon will have it all. ©2019 Dana Bay.All rights reserved. Website by UP.